The Gift That Keeps Giving! 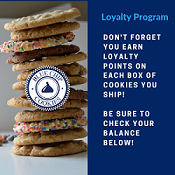 Save $5.00 on each box by being part of the Cookie of the Month Club and receive 2 free cookies! Valentine's Day: Perfect for Any Special Occasion. We send you our Collection of the Month. Great gift for Christmas, Happy New Year, Valentine's Day, Father's Day, Birthdays, Employee of the Year, Corporate Gifts, Wedding Gifts and more. Free Shipping, 2 Free Cookies and Free Seasonal Box! Renew ongoing, or cancel after 3 months. We send this cookie box every month, around the 15th, to the address you designate. If you want to create you own collection, choose the other Cookie Club: Create Your Own Cookie Club. Almond Toffee Chip: A cookie and candy in one. Buttery toffee, Guittard semi-sweet chocolate chips and toasted almonds makes this creation exclusively Blue Chip. A fabulous dessert! Black & White: White chocolate chips mixed with our signature oban-infused dough that offers a sweet and delightful profile. This one people remember from California, so unique! Blue Chip Royale: Take almonds, toffee brickle and rich white chocolate chips and you've got an imperial tasting cookie fit for kings and queens. It's a royal option and the proof is in the tasting. Chocolate Chip: The big kahuna, the grand slam, the most wonderful chocolate chip cookie you will ever taste. Baked with our signature dough and secret ingredients, this cookie is the one to stand the test of time. Yummy to the last bite. Voted best cookie in over 10 cities. Cinnamon Delight (Snickerdoodle): Our sugar cookie is infused with cinnamon and spice that has a profile that’s light and airy with great flavor. A favorite for many! Snicker-snap-snickery-doodle. This light and delicious cookie, coated with pure cinnamon, is a "Sinful" creation! Double Delight (alias-White & Black): We take our classic chocolate chip and add to it Guittard white chocolate. Pretty cookie that appeals to the dual nature of chocolate lovers. Lemon Delight: Our sugar cookie dough infused with lemon zest, and extract, light and airy! A melt in your mouth temptation, not too tart and not too sweet, like Grandma's sugar cookies but with a real lemon zest. Milk Chocolate: Milk chocolate Guittard chips in our signature dough. Oatmeal Raisin: A favorite of many, our oatmeal raisin is made with raisins, oats and macaroon coconut. Peanut Butter: Our signature dough is married with premium creamy-smooth peanut butter for that rich peanut-buttery goodness. Sugar-Plain and simple! : Tasty & delightful- an old-fashioned favorite! White Chocolate Chip: White chocolate is substituted with our classic chocolate chip cookie for a lighter, creamier, scrumptious cookies. White Chocolate Chip Macadamia Nut: What Blue Chip Cookies is known for across the country. "The first bakery to introduce the White Chocolate Chip Macadamia to the public. Our very own creation dates to 1982. This buttery rich cookie with white chocolate pieces surrounded by macadamia nuts is truly decadent. Warning: this cookie may be habit forming! Flavors available under the "Buy Single Flavor" or will be featured in the MyWay 1-2 months during the year. You can make special requests if you would like. Butterscotch Chew: Butterscotch chips and coconut blended into our signature dough that delivers a chewy, tasty twist on a cookie. Cherries & Cream: A great combination of cherries and luscious white chocolate chips in a mouthwatering experience you have never tasted. Coconut Chew: Chewy coconut shavings mix with macadamia nuts to really deliver a vacation away for just a minute or two. Toasted coconut and macadamia nuts make this cookie extra chewy, extra rich and extra delicious. It's the ultimate macaroon! Order by 1:00 pm EST Monday-Thursday, we will ship that day! We ship Monday through Thursday for arrival Tuesday through Saturday (unless it’s a FedEx holiday). Our goal is to deliver them within 2 shipping days, as our cookies have no preservatives. 10/5/2010 – Do you all still have the chocolate chip with pecans cookies. They are my favorite? Response From Blue Chip Cookies Direct: Yes...we can make them for you, just order the Chocolate Chip with walnuts and then write us a note in comments.